Been lusting after one since I first saw one. I know its going to very different to my 1150gs and 1100 Griso, never had cruiser style bike before but somehow this one appeals. Anyone got any tips of what to look out for regarding common issues ? Its listed as a 'touring' but don't think thats right as its not got the panniers, does have the HB sissy bar/rack and crash bars up front though. Issue with mine over 6 years and 26000 miles in all weathers. Condensation in the Speedo. A light misting on mine, replaced under warranty at 18 months. Leaky seat, again replaced. New one was the same. Moisture appearing through the vinyl, not at a seam. Worth checking. Look at swinging arm where rear wheel peppers it with gravel. Mine had gravel rash, cleaned off and protected with stone chip underseal. Same thing on crossbrace of frame under the engine. Mine had the panniers, screen, spotlights, heated grips etc. 100% reliable. Keep battery topped up and she starts instantly on the button every time. She was a keeper till the weight became an issue pushing it around the garage to access t'other bikes. The 1400 takes the space of two bikes. Oh, forgot. ABS sensor failed at 15000 miles...about 40 quid at dealers. Thanks for the feedback, I have read of issues with the exhaust X over cracking, exhaust brackets comming loose /breaking, misting clocks, rear bevel drive leakages from poor internal machining and rough running (snatchy transmission/bucking ride) at lower revs (sorted on my Griso with a Finbeau and air valve mods) Funny - similar issues to the Griso ! But many owners absolutely love the power and ride/ handling and I love the look. Got a test ride booked on a California 1400 2013..... Its listed as a 'touring' but don't think thats right as its not got the panniers, does have the HB sissy bar/rack and crash bars up front though. Are you actually looking at the California Custom rather than the California Touring? Significant differences of Touring over Custom include panniers, higher handlebars, windscreen, extra front lamps, bigger dual seat. From pictures I have seen of the Touring, this bike looks to me like a Custom with a small fly screen, added crash bars & HB back rest/rack. They have listed it as a Touring but there are NO panniers, touring screen, extra lights, touring seat, two tone paint on tank. I believe the custom has a slightly higher ride height to improve handling - not that I can tell that by looking at it ? Right - Test Rode !! WoW - FANTASTIC pulling power in Tourismo and Veloce and good handling, very comfy and lots of room to move about with footboards. Bit strange with gears and footbrake so far forward but easy to get used to. Lumpy, viby tickover quite characterful and smooth as silk on the move. Nice and low revving with plenty of pulling power even in too high a gear but open her up with revs and whoooooahhh ! But - the Lanfranconi exhausts are a lovely sound but so bloody loud for the rider, almost painfully so - don't know how loud they seem to passers by ? can you get DB killers for these ? Have asked if they have the standard pipes with it but they ar'nt sure. Also, let go of the bars and it pulls to the right - (my Griso does not at all, totally stable) - could this be a sign of rear subframe issues ive read about ? Also revs hang at about 1500 for a few seconds before dropping to tickover. 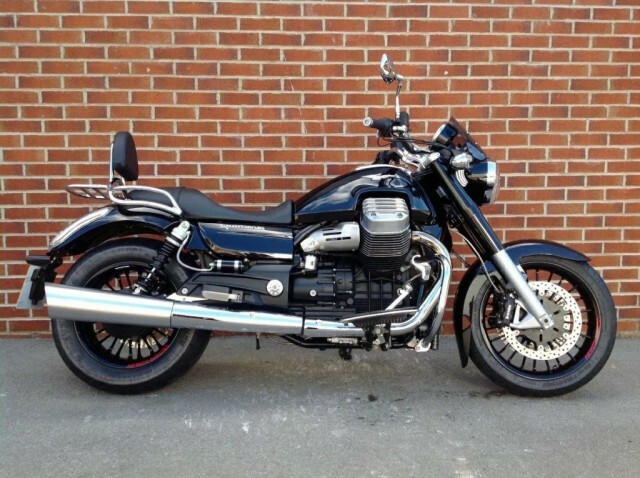 Apart from that it looks immaculate and with metzeler tyres. That's odd. My Touring would track dead straight with cruise control on and hands off bars. While rolling a fag at 70 mph. Which is strange as I'm a non smoker. To get the bike off line took a lot of effort. So not sure why your test ride bike pulled right. I think the X pipe issue affected the earliest bikes. My 2013 was fine. I presume the cali 1400 has a catalytic c, is it under the bike or in the standard exhaust ? Do the lanfranconis have one in and does the bike need an electronic box of tricks to let it run right ? That bike's a lot cheaper than any of the other ones advertise....funny that. Original silencers contain the cat.converter under the heat shield portion. Don't know about after market stuff. The engine revs 'hanging' before dropping to takeover 1100 to 1300 rpm was normal on mine and the 2 others I've ridden. Just ignored it having learnt to declutch a little earlier rolling to a stop...otherwise high takeover causes a higher than expected approach to give way/ stop signs. If it looks too good to be true then it probably isn't.